I constantly hear from leaders that they are doing too much. I respond by asking how they contributed to the situation. The first response to that question is a puzzled look. It’s a revelation that we actually cause problems as leaders. It is a very sobering fact that we set up problems. Many of those problems are set up by the leader’s over-activity – talking too much, over functioning, defining all the solutions, and telling others what to do. We have learned from others that these are things leaders do. We have been taught the wrong things. Talk less and listen more – Over-talking is easy to do. After all, the leader owns the vision and knows more than anyone else, right? Wrong! Once a leader said to me that they were always right. I responded, suggesting that it was more important that the members of the team be right. Too much talking is a sign that the leader is anxious and blocks input from others who might have the right ideas. Observing and listening are primary leadership skills. Doing less and getting more done is empowered by not talking, and listening more. Ask good questions and listen to the answers – Many leaders perceive that they must have all the answers. I disagree. Leaders must ask good questions. That’s the first part. The second part is to listen carefully to the answers. It’s amazing what you can learn by listening if you take away the need to be right and the need to respond to those answers. Listen. Leave some silence. Then respond, if appropriate. Doing less and getting more done is empowered with good questions and intentional listening. Observe and respond – Leaders listen to the words from others. Watching how people respond is very informative. Research tells us that only 7% of a communication is in the words. Observe what’s happening and observe how things happen. The musical conductor guides the music making and does not make the music. Reacting is a negative energy. Responding comes with discernment. Watch, think, listen, and then respond. Many times a response is not necessary. Having good people and getting out of their way is a good leadership skill. 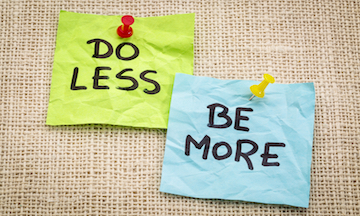 Doing less and getting more done mostly happens when the leader observes. Function less and empower others to function more – Over functioning is a leadership disease. More leaders have it than not. The reciprocity to over functioning is under functioning. The musical conductor draws out the music from the ensemble. Leaders let others function. Doing things for others, making all the decisions, planning all the action steps, and telling others how to think, bring negative energy and animosity. 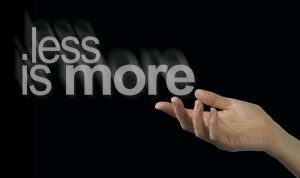 Doing less and getting more done means doing less. Really! Coach others to solve problems – This is the same theme. Don’t solve the problems. Ask others what they would do to solve the problem. This is not giving up leadership authority. This is inviting others to think. This is giving team members the permission to participate. Micromanaging is telling others how to do things. Coaching is leading others in learning how to do things better. This includes learning to solve problems. If the leader solves all the problems, then the team is dependent on the leader. Effective leaders lead others into higher functioning. Doing less and getting more done is facilitated by coaching others to be better leaders. A good routine for leaders is the daily assessment. Schedule a time at the end of each day to reflect on the day’s activities. Take notes on what went well and what needs changing. Learn from yourself. If others are not producing up to expectations, then look in the mirror and see what to change about yourself. Organizational transformation begins with the leader’s transformation.